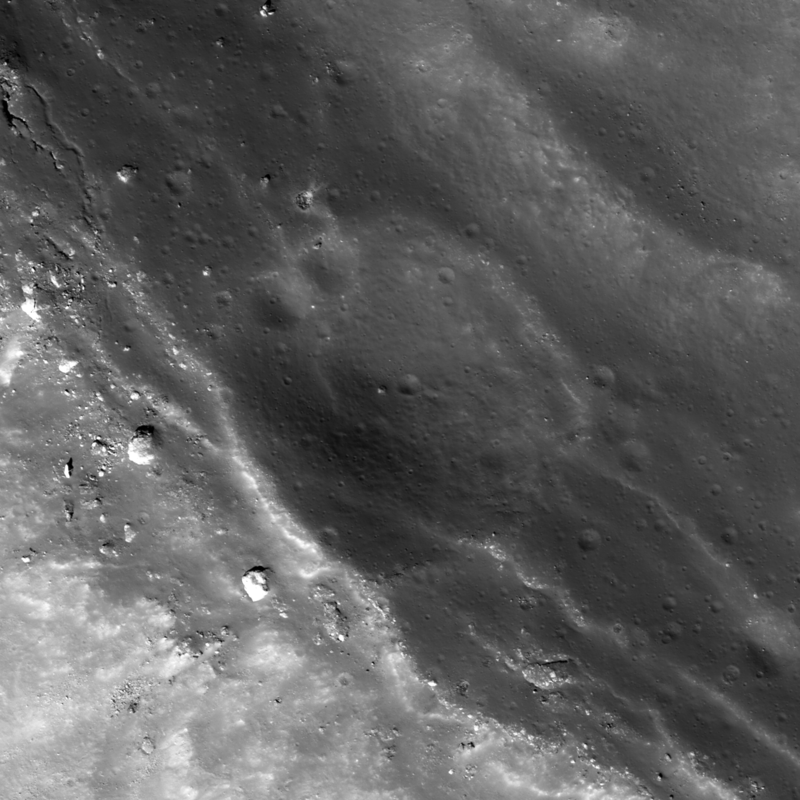 A complex wrinkle ridge deforms Mare Frigoris (52.935°N; 11.131°E). 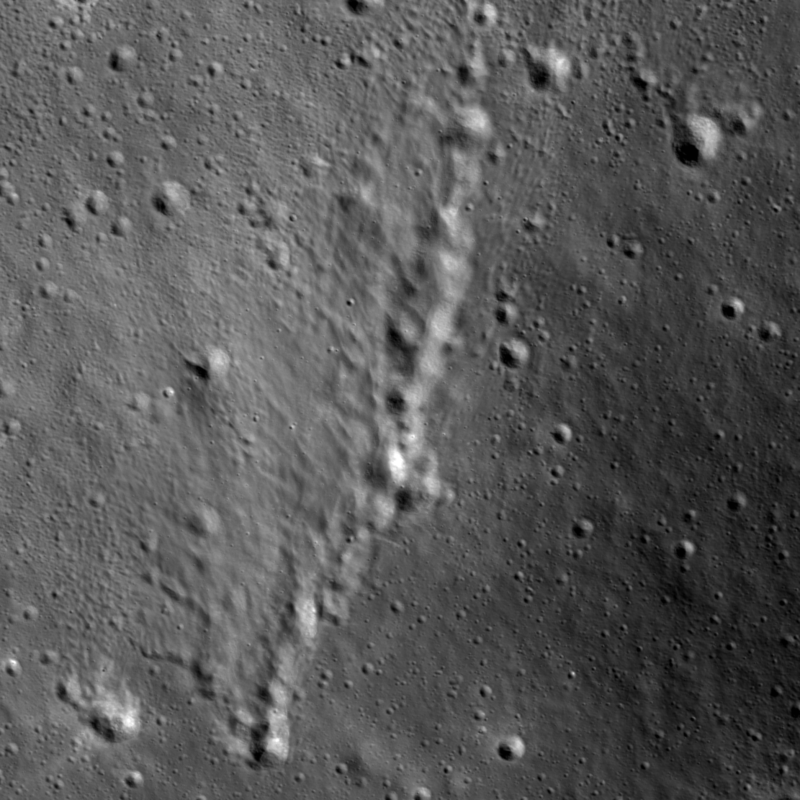 NAC frame M181102837R, illumination is from the west (left), north is up, image is ~2.0 km wide. White arrow indicates small extensional feature discussed in text. [NASA/GSFC/Arizona State University]. 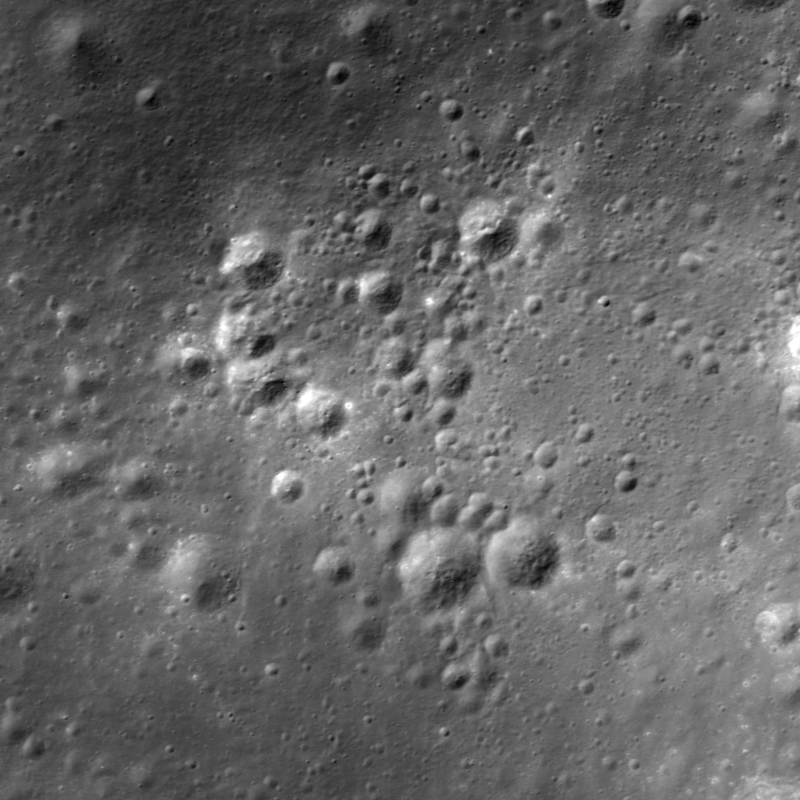 A cluster of secondary craters found in the highlands adjacent to Mare Moscoviense (28.803°S; 142.876°E). NAC frame M1104980770R, illumination is from the southeast, north is up, image is ~1.4 km wide [NASA/GSFC/Arizona State University]. 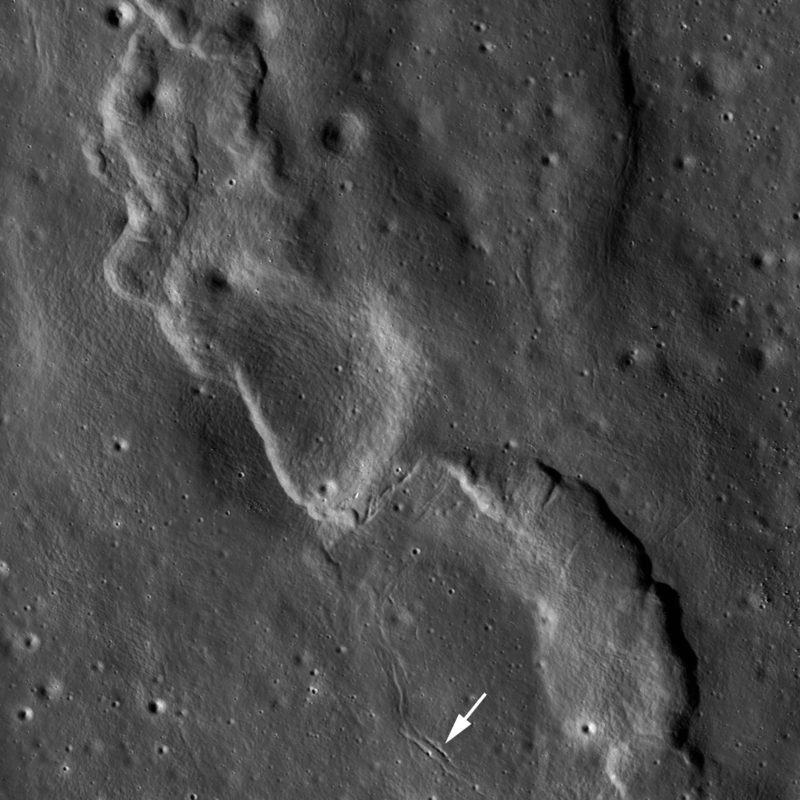 Debris flows converge at the bottom of a crater (32.660°S; 143.668°E). NAC frame M1107331321R, illumination is from the east-southeast, north is up, image is ~1.4 km wide [NASA/GSFC/Arizona State University]. Symmetry in an Asymmetric Pattern? 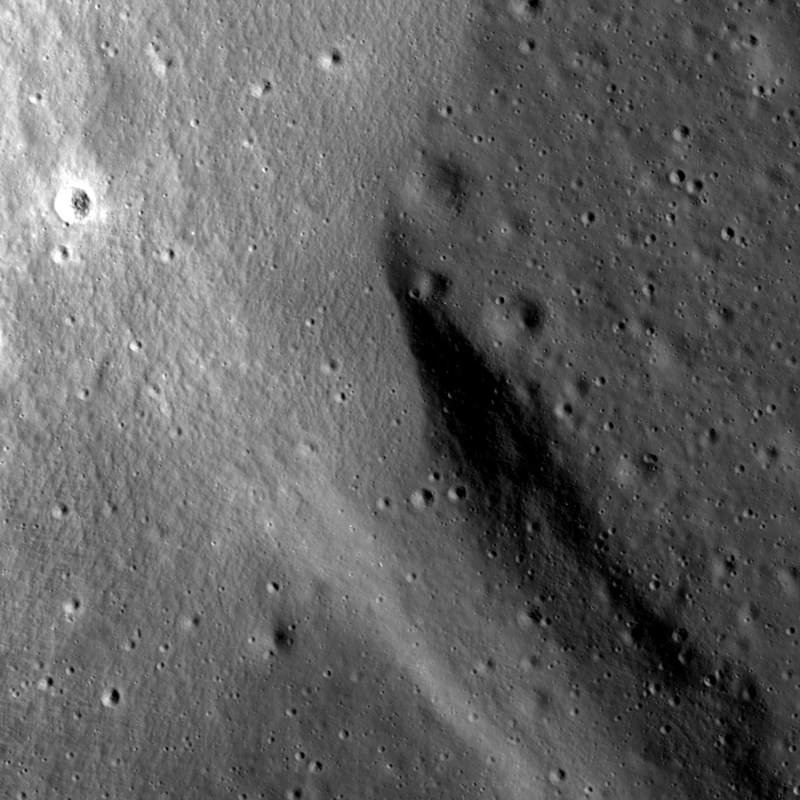 A beautiful example of an asymmetric impact feature (27.674°S; 125.465°E). NAC frame M110771566R, illumination is from the northeast, north is up, image is ~1.2 km wide [NASA/GSFC/Arizona State University]. 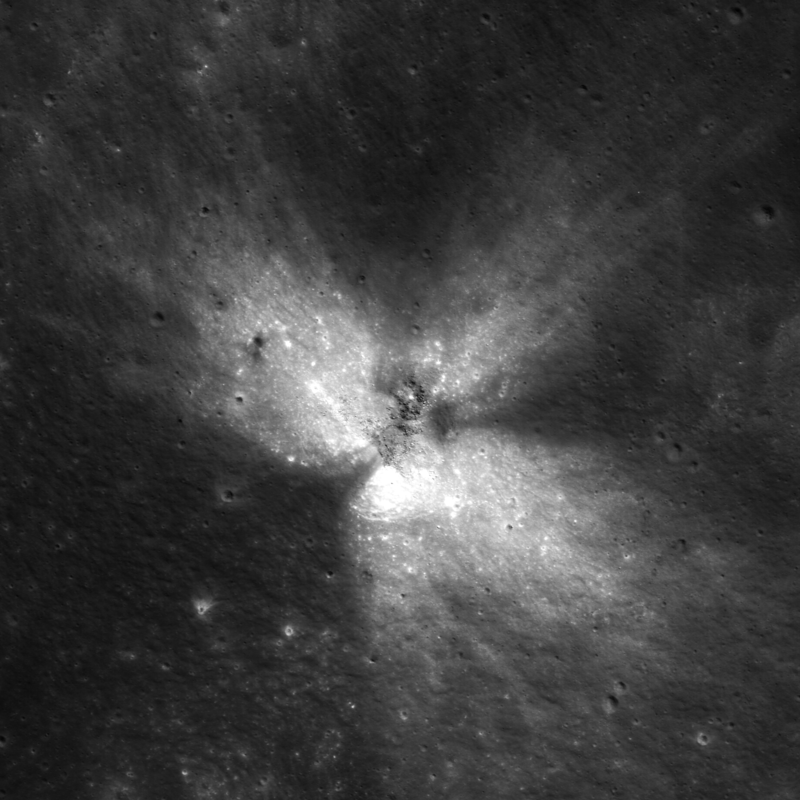 A lunar rille comes to an abrupt termination at a crater rim (34.342°S; 145.430°E). NAC frame M1122636898R, illumination is from the east-northeast, north is up, image is ~1 km wide [NASA/GSFC/Arizona State University]. 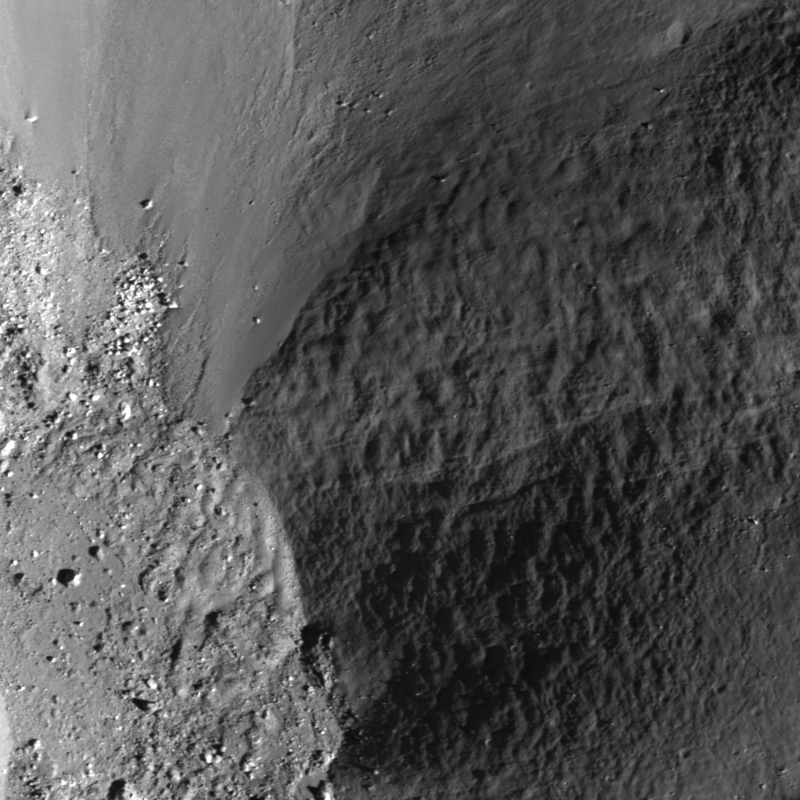 A sharp reflectance contrast is found in Humboldt crater (26.593°S; 83.764°E). NAC frame M182974061L, illumination is from the west, north is up, image is ~850m wide [NASA/GSFC/Arizona State University]. A chain of impact features provides a picturesque tableau (48.659°N; 103.299°E). NAC frame M18286833R, illumination is from the southwest, north is up, image is ~2 km wide [NASA/GSFC/Arizona State University]. 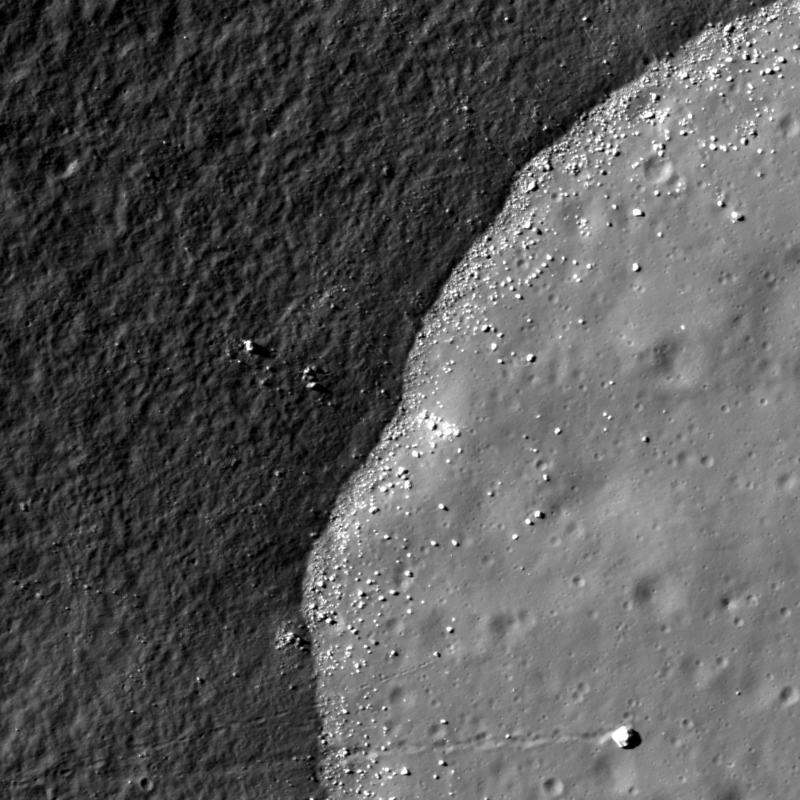 A NW-SE oriented groove is seen between two inselbergs in Sinus Honoris (12.276°S; 18.712°E). NAC frame M181944849L, illumination is from the west, north is up, image is ~5.5 km wide [NASA/GSFC/Arizona State University]. 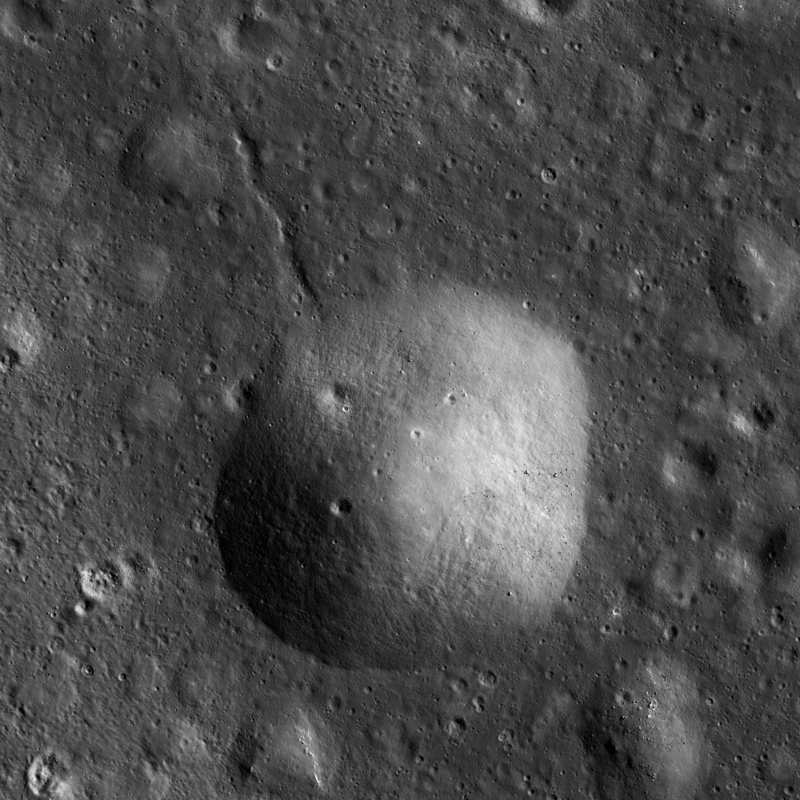 An impact crater is caught in the process of disintegration and is barely visible today (40.881°N; 150.608°E). NAC frame M169574198L, illumination is from the southwest, north is up, image is ~600 m wide [NASA/GSFC/Arizona State University]. 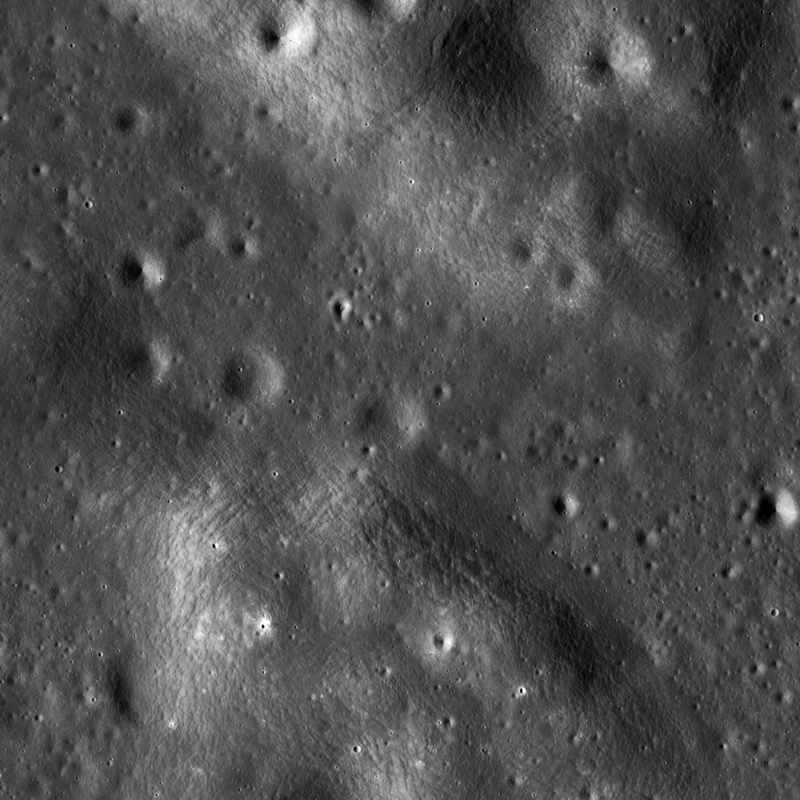 Distinctive positive-relief features on the floor of Stevinus crater (32.760°S; 53.739°E). NAC frame M113603383L, illumination is from the east, north is up, image is ~2.3 km wide [NASA/GSFC/Arizona State University].